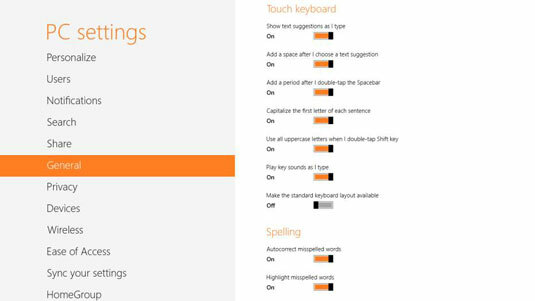 Windows 8 offers numerous settings to tweak the keyboard’s behavior on your tablet. Most options come turned on by default, so if something about the keyboard bugs you, you can often fix the problem simply by turning off that particular setting. But whether or not you’re happy with your keyboard, drop by the keyboard’s settings area to make sure the keyboard is customized to meet your own needs. From any screen, swipe your finger inward from the right edge to fetch the Charms bar. From the Charms bar, tap the Settings icon; then tap Change PC Settings from the Settings pane. When the PC Settings window appears, tap the General section. Scroll down to the Touch Keyboard section, and touch any of the toggles to turn their features on or off. There, in the Touch Keyboard section shown and the adjacent Spelling section, you can change how the keyboard responds to your fingertips. Most of the settings are self-explanatory. Simply tap the toggle switch to the right of the setting, and it switches On or Off. For example, the Capitalize the First Letter of Each Sentence option capitalizes the first letter you type after typing a period. This little timesaver saves you a trip to the Shift key, subtly speeding up your typing. Don’t like it? Tap the On toggle to turn it to Off. One gem here, which is normally turned off, is Make the Standard Keyboard Layout Available. When you turn on that option, your keyboard selection button includes an option to fetch a full keyboard, complete with a row of numbers along the top, function keys, a Windows key, and other keys you may find to be essential. Down the road, should you stumble upon a program that insists upon your using those keys, Standard Keyboard will be listed as an option.